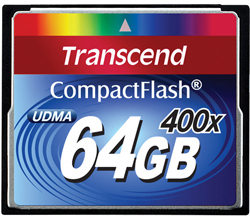 The 64GB 90MB/s UDMA CompactFlash Memory can record about 1.5 hours of HD video and has a built-in Error Correction Code that detects and corrects error during data transfer. It is supported by most DSLRs with CF card slots. This card is not recommended for shooting video at any quality above HD. Please consider instead the SanDisk 64GB Extreme Pro 160MB/s CF card. • Do not confuse CF memory with CFast memory. CF/CFast are not interchangeable. • This card is not recommended for shooting video at any quality above HD. Please consider instead the SanDisk 64GB Extreme Pro 160MB/s CF card.